Clipping Chix: Amazon: 62 pcs Christmas Photo Booth Props only $9.99 + FREE Shipping with Prime! Amazon: 62 pcs Christmas Photo Booth Props only $9.99 + FREE Shipping with Prime! 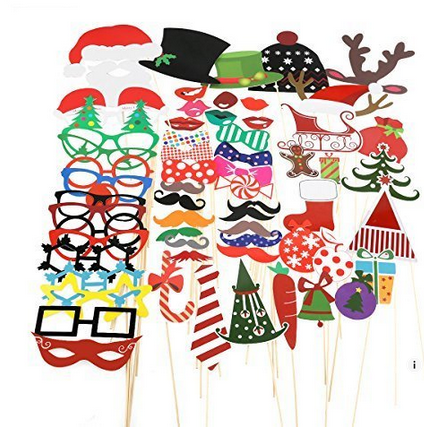 Right now you can get this fun 62pcs Christmas Photo Booth Props for only $9.99! This kit is great way to celebrate Christmas with your friends & family. Plus you can get FREE shipping on orders over $49 or if you are an Amazon Prime Member. Newest design! 62pcs Christmas Ornaments Photo Booth Props. They are super fun and this easy DIY Photo Booth is perfect for any occasion! This kit comes with 62 different Christmas Ornaments Photo Booth Props for all your playful and party occasions. Includes Gingerbread man, Candy cane, Santa Ride,Christmas candles,Christmas bells,Christmas tree, Christmas Stocking, mustaches, eyeglasses, ties, hats, bows, fake lips and more. From holidays to weddings to showers to birthday parties, photo booths are all the rage right now! Why not use this Christmas Ornaments Photo Booth Props to liven up your Christmas? Your kids will defiantly love them! Quick and easy to assemble; simply attach the included bamboo dowels to each prop using the included clear stickers. Material: Cardstock with bamboo rods.